Ian Parker never owned a boat before purchasing his Windsor Craft 36. However, despite taking delivery in the middle of winter, he took to boating like a duck to water and soon became adept at handling his mahogany beauty, Sea Major. He began to use it almost daily—something that he continues to do today. Parker is a world-renowned Canadian pianist. He recently returned to B.C. after spending the past 18 years living in New York, where, at the age of 18 he was accepted at the Juilliard school of music. 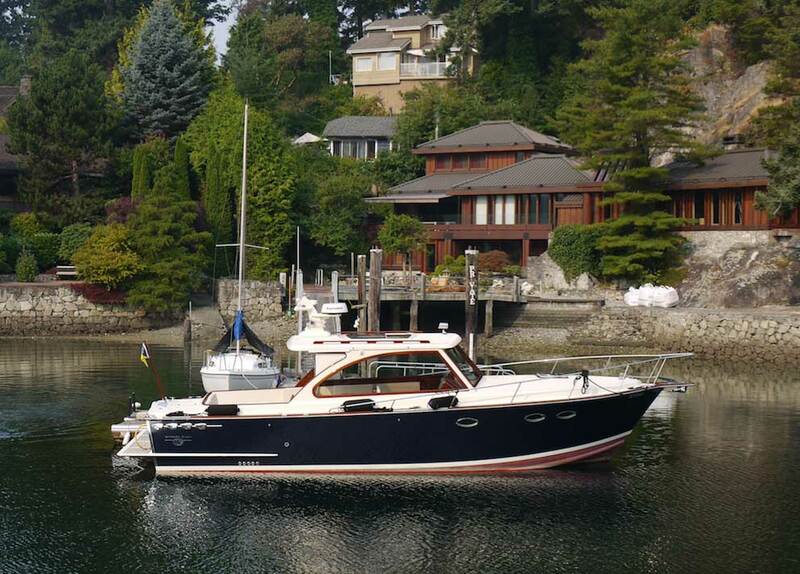 His credits and awards are far too many to list here, but after I heard him play at his waterfront home in West Vancouver, I realized that classical music and classic yachts go together like gin and tonic. His new boat is almost equally awesome as his music. Wood. Really? In this age of “plastic” boats, few buyers are interested in new wooden boats, and accordingly, the market is small. However, wood—and acres of it—was an absolute requisite for Parker. This isn’t surprising considering he has lived his life surrounded by symphonies full of musicians playing finely crafted wooden instruments such as the cello, violin and piano. After acquiring his waterfront property, Parker decided that a boat would be an appropriate addition. He contacted David Siradze of the SV Business Group. That company specializes in finding unique yachts from all over the world and bringing them to the West Coast. Said Siradze, “We showed Mr. Parker lots of interesting and beautiful yachts including Hinkley, San Juan and Chris Craft, but it wasn’t until he saw photos and videos of the Turkish-built Windsor Craft that he knew that this was the one for him! Its beautiful classical lines and one-of-a-kind mahogany woodwork immediately captured Mr. Parker’s heart.” Siradze then flew to the Vicem factory in Istanbul where over the next few days he inspected the factory and the yacht, finalized the customization details and made shipping arrangements. A Convoluted Story The Windsor Craft brand was developed in 1990 as a special project of Irwin Jacobs, then CEO of Genmar, one of the world’s largest recreational boat builders. Irwin’s love for the classic wooden day boats of the ‘20s and ‘30s led him to recreate the historic designs. Production of the 30, 36 and 40-footers began in Minnesota where they were built from fibreglass with mahogany cabins and teak decks. However, the fine craftsmanship they required slowed production of the other less-labour-intensive Genmar brands, so after producing about 100, the Windsor Craft line was shelved. In 2007, wanting to bring back the classic line in its full glory—but this time in wood, Jacobs searched the world for an appropriate builder. Having realized that it would be too costly to produce the yachts in North America, he selected the well-respected Turkish builder Vicem Yachts. Vicem was created 25 years ago and company literature claims it capitalizes on the experience of 2,000 years of Turkish woodworking artisans. The company offers several “Maine lobster boat”-type yacht lines, sportfishers, and megayachts to 46 metres (150 feet). Most are built of wood. The company lays claim to being the world’s largest builder of classic luxury motor yachts, with more than 150 launched to date. With steady orders from Genmar, Vicem built 50 Windsor Craft over the next few years. It was going well until Genmar declared bankruptcy in 2009. In 2012, Vicem took ownership of the unfinished hulls and had the remaining stock returned to Turkey for refitting and then most were brought back to the US for sale. Ian Parker’s 36-footer was the last of the original Windsor Craft. Construction Windsor Craft are constructed from cold-molded mahogany. The process involves applying solid wood strips of veneer in three opposing layers over the mold, then saturating each layer using two-part West System epoxy. Vicem says that this results in hulls that are lighter, stronger and more durable than traditionally built fibreglass boats. Each hull is said to take 3,800 man-hours to build. Parker’s boat had never been launched and sat idle for a number of years. Once he placed his order, the plant undertook a complete refurbishing including renewing paint and brightwork. They reconditioned the twin Volvo Penta D6 330-horsepower diesels with Bravo 3 legs (with only nine hours on them). In addition, Parker ordered several custom touches that included a full canvas “Alaskan bulkhead” to enclose the helm station, an electric sunroof, a wine fridge, an electric grill with a second fridge, Webasto forced air heating and the latest Raymarine electronics. Parker’s yacht was configured to allow entrance to the cockpit through the port side of the swim platform. Other builds had access over the bulwarks, which allowed a U-shaped settee in the stern but made it more awkward to climb aboard. On Board Upon boarding, one is immediately struck by the acres of high gloss mahogany woodwork and the impeccable joinery). Vicem prides itself on its high gloss finishes and uses 10 coats of urethane varnish over bare wood. It is interesting to note that several of the unsold Windsor Craft sat under the Florida sun for three years yet their brightwork reportedly still looked like new. That’s a pretty impressive testimonial, especially as Parker does not plan on keeping his yacht in a boathouse. The twin diesels are accessed though a hinged hatch that raises the aft portion of the L-shaped cockpit settee via a hydraulic ram. A ladder leads below and there is very good access all around the engines. Another hinged hatch forward in the cockpit sole provides excellent access to a large storage area as well as the fuel and water tanks, water heater, seawater strainers, batteries and the generous 10 kW Onan generator. The flooring throughout the cockpit/helm area is teak planking, which wisely is being left to weather naturally. While the Windsor Craft is an open-back hardtop, the canvas and clear Strataglass “Alaskan Bulkhead” enclosure seals the forward cockpit/helm area to allow for all season cruising. With both reverse cycle air and Webasto forced air diesel heating, the area will be comfy regardless of the weather. Behind the fully-adjustable electric helm bench seat is a finely crafted gloss mahogany cabinet with a lid that opens to reveal a black granite countertop, an electric grill and sink, with a wine cooler and second refrigerator underneath. This outdoor galley will prove to be the place to cook from on those beautiful sunny evenings at the dock or at anchor. A plush linear lounge runs along the port side and folds down as an additional berth. The helm console is built around another beautifully crafted mahogany cabinet that includes a single, large, Raymarine flat screen multifunction unit with radar, autopilot, Volvo digital engine readouts, electronic throttles/shifters and the standard VHF radio, gauges and switches. Accommodation The accommodation area forward features a teak and holly cabin sole, a bow berth, a linear galley area to port and the head/shower to starboard. The mahogany below is mostly satin finished with gloss trim, which works well considering the huge amounts of wood. Again, the woodwork is exquisite and the galley and head compartments are truly works of art. The berth can be configured as two singles or, with an infill cushion, it becomes almost palatial in size. The headliner in the accommodation area and the covered cockpit area are of off-white molded fibreglass that looks like tongue and groove planking. This is a real traditional touch from the days when overheads were planked and it adds even more of the classic look to this yacht. All doors are solid mahogany, another feature seldom seen today. Overall the interior brings to mind those of yachts built for the very rich. Local restored classics such as Deerleap, Olympus and Taconite come to mind. Despite this, the Windsor Craft has discreetly incorporated modern electronics and fixtures (electric head, electric cooktop and so on). Underway The bow thruster and the twin stern drives made it a snap to get away from the dock. The diesels were well matched to the hull and we accelerated quickly onto the plane. It didn’t seem to make a difference as we transitioned to the plane whether or not we used Volvo’s “Interceptor” trim tabs. Either way, it took a few seconds longer than I would have liked for the bow to drop back down. For those not familiar with interceptor trim tabs, they are a Volvo invention where flat plates are built into vertical slots in the transom and extend perpendicular to the hull bottom, instead of the horizontal Bennett-type trim tabs. Our top speed was 33 knots, but a more economical fast cruise speed was 27 knots (at 2,900 rpm) while burning 77 litres per hour (20.3 US gallons per hour). This translates to 0.35 miles per litre (1.33 miles per gallon). At slow cruise of 23 knots (at 2,570 rpm) our fuel burn was 57 litres per hour (15 gph) or 0.40 miles per litre (1.53 mpg). These numbers are equal to or slightly better than other similar vessels I’ve tested. What impressed this reviewer the most about the performance was the solid ride, thanks in part to the characteristics of a wooden hull. There was no pounding through large ferry wakes, just a gentle rise and fall of the bow. Thanks also to the wooden hull, there was considerably less wave noise inside than with fibreglass. The bow did a good job of deflecting spray and we had a very dry ride. As expected with stern drives, the turning radius was impressive—less than one-and-a-half boat lengths—and there was no cavitation or slipping. Even at 30 knots, the Windsor Craft felt comfortable, more like we were going 20 knots. If I had to classify the ride in two words, I’d use stately and sporty. Peter A Robson has more than 25 years of experience in the fields of book and magazine writing, research, editing and production. He has edited numerous magazines including Pacific Yachting. His has authored or contributed to a number of award-winning books on diverse subjects such as commercial fishing, forestry and salmon farming. Though his home is in British Columbia, his assignments have taken him throughout North America, the Bahamas, the Caribbean, Australia, China and South America.